We first heard about Lift last summer, the forthcoming app from former Twitter co-founders Ev Williams, Biz Stone, and Jason Goldman. 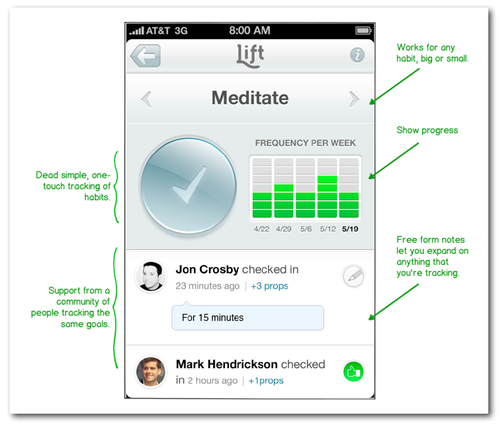 Lift’s signature line – “achieve anything” – would easily lead you to assume it will be a part of the Quantified Self movement. And it appears you would be right. The team recently began to take the wraps off the stealth startup, revealing just a bit more of what Lift will be about in a blog post. It’s a habit tracking tool that wants to “push the envelope of human potential through positive reinforcement.” And admittedly, those behind the project haven’t said much else about Lift until now. So here’s the quick and dirty on Lift: it’s an iPhone app launching in August and the beta testing has focused on using it for health, fitness, productivity, happiness, and relationships. “We want to eliminate willpower as a factor in achieving goals,” the team writes. “Imagine smooth, fun, optimized, self-reinforcing paths for every aspiration. That would qualify as a giant impact on human potential. We think we can turn chores into positive draws.” It’s a bold statement, but one that Lift’s founders are prepared to back up. The idea appears to be turning chores and goals into tiny habits, extremely attainable actions, and put users on the track toward the long term. And when I say tiny habits, I mean tiny habits: the recent post mentions flossing as a tracked habit. The app includes visuals illustrating your progress, complemented by a cheerleading social network of users you support who support you, too. Last month, co-founder Tony Stubblebine talked about taking the Quantified Self movement beyond gamification techniques. Actually, once Lift took gaming elements out of the beta version, user retention increased enormously. As the wait for Lift nears its end, there is plenty of movement in this market to consider. TenXer (a play off of “10 times better”) is an MIT-born startup backed by Jeffrey Ma – part of the MIT Blackjack Team in the 90s that inspired the movie 21. TenXer is supposed to help with work efficiency by tapping into cloud-based applications to measure your effectiveness. And there is hardly a shortage of gadget + app combos out there that track your physical self. The Jawbone Up, Nike+ Fuelband, and FitBit are just a few examples. So what will make Lift different? Well, the idea of tracking and analyzing your entire life is a daunting one, and if the team can inject some simplicity and manageability into the whole thing – and keep it all app-centric (read: free – no supplementary device purchase needed!) – Lift might be able to inspire a group of consumers who haven’t bought into the movement just yet.